Sen. John McCain speaks at the 2010 Commencement. Listening are (from left): President Rock Jones, Provost David Robbins; Life Trustee Kathleen Rhinesmith ’64, and registrar Shelly McMahon. The passing of longtime Sen. John McCain on Aug. 25, 2018, after a battle with brain cancer, prompted reflections and testimonials from around the world. Among those who delivered a eulogy for McCain was former Secretary of State Henry Kissinger. 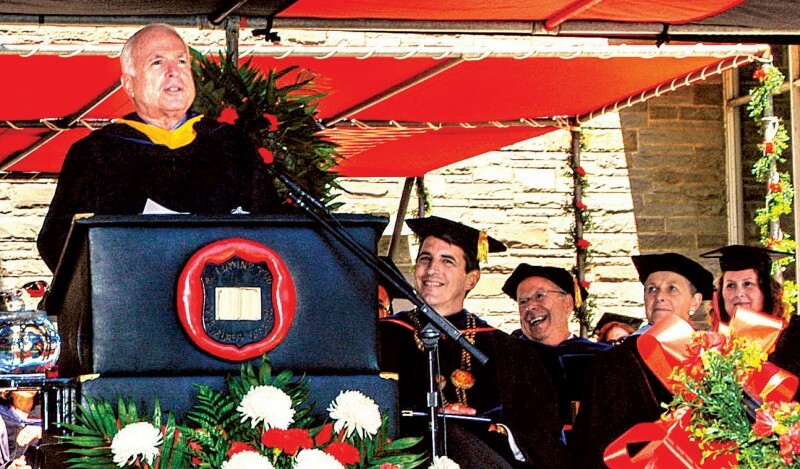 McCain delivered the commencement address at OWU in 1997 and 2010, in part thanks to his good friend Evan Corns ’59, a member of the OWU Board of Trustees. Siham Gheewala ’10 was among those seniors who took McCain’s 2010 message to heart, although she admits it took a while to sink in. After graduating from OWU, she completed her master’s degree in education at the Harvard Graduate School of Education. 1997: All of you will eventually face a choice, earlier in life than you may now presume, about whether or not you will become leaders in society or whether you will allow others to assume that responsibility while you attempt to reap the blessings of a prosperous country without meaningfully contributing to their preservation. I very much hope you will choose the first course. ... As Socrates contended, “The unexamined life is not worth living,” so I contend that the passive life is not worth forgoing the satisfaction of knowing that you chose to employ all the blessings God bestowed on you to leaving the world a little better for your presence in it. 2010: We are all afraid of something, whether it’s failure, or dispossession, or mortality, and the sacrifice of time that becomes so precious to us. But we should not let the sensation of fear convince us we are too weak to have courage. Fear is the opportunity for courage, not proof of cowardice. No one is born a coward. We were meant to love. And we were meant to have the courage for it.